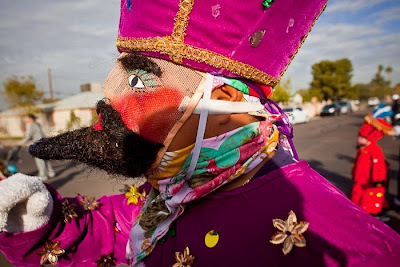 A Matachine dancer participates in a procession to honor the Virgin of Guadalupe during a service in Phoenix Saturday morning. Catholic churches, especially ones with a lot of Latino parishioners, celebrate Dec 12 as the Virgin of Guadalupe day. The most basic symbol of the dance is good vs. evil, with good prevailing. The legendary Aztec ruler Montezuma and la Malinche represent good, the bull who represents mischief, and Spanish Conquistador Hernán Cortés, represents Satan or evil. Los matachines denotes a traditional religious dance and the dancers, musicians, and elders who participate in it. Its roots go back to a type of widespread medieval sword dance called a morisca. Originally, the dances acted out the battle between Christianity and paganism. The Spanish brought the ritual with them to the New World, where over time it incorporated Mexican, Indian, and American religious and social symbols. Like so many facets of Mexican Catholicism, the matachines blend Spanish Catholicism with pre Columbian beliefs. Observance of the holy day has spread throughout the US with Mexican immigrants who have brought their religion and culture with them. There are more photos from today’s celebration in my PhotoShelter archive and available from ZUMA Press.